As Google's upcoming augmented reality glasses show, digital media is fast encroaching on every aspect of modern life. The pace of technological change has been phenomenal, and as technologies converge and media habits change, marketers need to adapt their budgets accordingly. As part of a 2012 review, Netimperative looks back at the 10 most popular digital media news stories and trends of the year. This year saw many key trends emerge, such as 'cord cutters' in the US ditching cable subscriptions to watch TV online only. Microsoft made its biggest gamble yet, with a bold new design for Windows 8 to rival Apple and Google with a cross-platform operating system. Google took on Dropbox with 'Drive' and iTunes with 'Play', and YouTube now makes as much ad revenue as US TV networks. In these austere times, it's telling that a financial website, MoneySavingExpert, was one of the biggest success stories of 2012, selling for £87m. View our top 10 biggest digital media headlines below. Watch this space for updates on the top 10 advertising, mobile, search, social, ecommerce, multimedia, gaming and regulation news of the year- all coming this week. 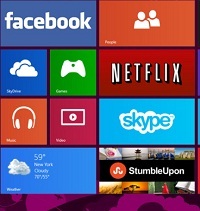 Microsoft has launched Windows 8, designed to run on PCs, tablets and smartphones, as the software giant looks to take on Apple and Google in the lucrative mobile operating system market. The new operating system, still the most widely used in the world, signals the biggest change at Microsoft since the emergence of Windows 95. About half of business users still have not upgraded to Windows 7 from Windows XP, which came out in 2001. YouTube’s skippable ad format is now making Google as much revenue per hour as ads on cable TV, according to YouTube’s global head of content. Speaking at the Mipcom TV industry event, YouTube global head of content Robert Kyncl claimed the group’s skippable ads format means it is now matching US cable groups in terms of per-hour revenue. Google has revealed details of its research into augmented reality glasses, as part of a bid to introduce wearable computing into the mainstream technology industry. The firm released a short video demonstrating how the technology, still in development, could work. The wearer is seen taking pictures, checking the weather, getting directions, and placing a video call, all of which are controlled using voice activated icons that appear in the user's field of vision. Google's Chrome browser has surpassed longtime frontrunner Internet Explorer as the most popular browser in the world, accoding to new data. The results have been contested by Microsoft, which claims the findings are based on flawed data. Google has launched its much-anticipated Google Drive, an online storage locker that lets users store as much as 5GB of photos, documents, music and videos for free. The cloud-based service is offering more space for a monthly fee, starting at 25 GB for $2.49 a month, 100 GB for $4.99 a month or 1 TB for $49.99 a month. Those who upgrade their accounts will also get upgraded to 25GB of storage in Gmail. The prices are a blow to Dropbox, which offers 2GB of storage free, and then gives users the option of paying $10 or $20 a month to upgrade to 50GB or 100 GB of storage. Google has rebranded its Android Market under the new name of Google Play, bringing together the internet giants various download stores in abid to challenge the likes of Apple and Amazon. Google has launched the service on mobile devices that run its Android operating system and will release a Web browser-based version for personal computers. In a controversial move, Microsoft is set to close down its free iconic instant messenger service Windows Live Messenger, replacing it with Skype, the video chat service it bought in May last year. Windows Live Messenger was first released as MSN Messenger back in 1999, and is still behind only Yahoo! Messenger in the global IM market. However, Windows Live Messenger’s audience shrank by 48% last year, according to internet analysis firm Comscore. Windows Live Messenger is used by over 330 million people but Skype has over 600 million users. The Daily Mail’s Mail Online has become the world’s most-read online newspaper, attracting 45.3m unique users in December to leapfrog the New York Times (44.8m), according to new research. Figures from comScore, indicate that USA Today, the US-based Tribune newspapers and the Guardian filled the remaininjg top five spots in December 2011. Financial information website MoneySuperMarket has been sold for £87m, with its high-profile founder Martin Lewis pledging to give a portion of his payout from the deal to charity. The firm is being bought by MoneySupermarket.com which runs an online price comparison service. Martin Lewis will remain as editor-in-chief of MoneySavingExpert, which will retain its editorial independence via an agreed editorial code.